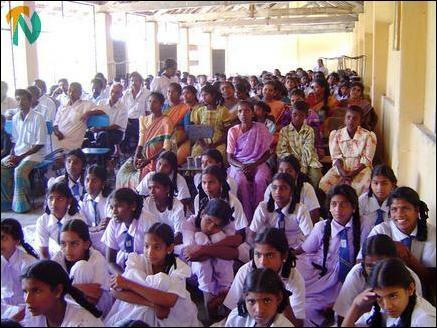 The first batch of thirty seven students identified by the Child Welfare Unit of the Tamil Rehabilitation Organization (TRO) in Trincomalee district as school dropouts in Sinnakulam, Pallikudiruppu, Thangapuram, Santhanaveddai, Chenaiyoor, Santhosapuram and Kadatkaraichcenai in the Muttur east were re-enrolled for studies and were distributed with learning equipment and clothes for uniforms with the assistance of the UNICEF at an event held at Chenaiyoor Central College Friday to mark the World Education Awareness Day. Trincomalee TRO Child Welfare Unit through a survey identified school dropouts in several villages in Muttur east and submitted a list of 37 students to the UNICEF with a request to make immediate arrangements to readmit them in schools in their villages with necessary assistance to continue their studies, sources said. ( L-R ) Trincomalee UNICEF official, Mr.Uthayakumar, and Mr.Logitharajah of the Zonal Education Office (both with garlands) are at the inaugural event. Mr.P.Uthayakumar, the UNICEF's Trincomalee co-ordinator, speaking at the event commended the Trincomalee TRO for making the effort a succeed. He appealed to the parents not to allow their children to be employed in order to earn due to poverty. "Several social organizations are in existence to help poverty stricken families. Education is a must for development of the future generation. It is a crime for parents to deprive education to their children citing reasons of poverty and other social difficulties," he added. Mr.Thilakan of TRO, Mr.S.Logarajah, Assistant Director of Education (Planning) and several others also spoke. 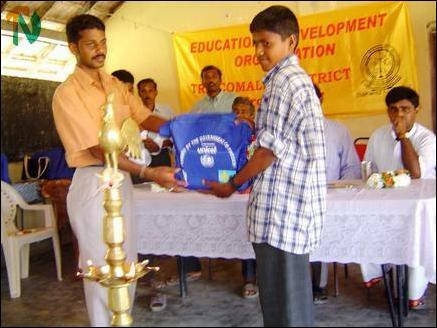 TRO official Mr.Thilakan handing over UNICEF learning equipment to a student re-admitted to school.